I’m looking forward to a special event that will be coming up in just a few weeks. On Saturday, Sept. 3, I’ll be traveling back to my old home base of Manistique, Michigan, for a book signing at one of my favorite stores, The Mustard Seed. 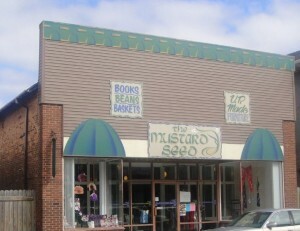 I’ll be there from 1 to 3 p.m. that day, signing copies of Whispered Echoes and no doubt reading a story or two. I lived and worked in Manistique for seventeen years, from March 1995 to February 2012. For the first year or so after I moved away, I made a number of return visits, but as often happens, those visits gradually grew farther and farther apart. My last trip there was a quick lunch-and-dash in … wow, November 2014. Tempus fugit, indeed. I’m especially excited because my book signing will coincide with the annual Manistique Merchants Association Car Show, an event I worked at for many years. At various times I helped with set-up and registration, ran the kids’ tractor pull held during the show, and pitched in on various other tasks. Of course, I also covered the show each year in my job as editor of the town newspaper, the Pioneer-Tribune. If I’m not mistaken, this year marks the 20th anniversary of the show. It will be fun to see how much it has grown over the years. We will be there to see you and hopefully hear one of those stories! So happy for you.